2/19 – Another IF (Interactive Fiction) game idea, this one inspired by Jamie Brew’s excellent predictive text shenanigans on twitter. Essentially, I think it would be fun to do some generative IF, and see how it plays. 2/20 – Spent a bit of time thinking about a visually upgraded Minecraft, and that led me to imagine an ice castle building game. Minecraft for winter wonderlands. More light options and blocks that glow and melt and reflect. Find frozen wooly mammoths and fossilized neanderthals. A different block type for each of the eskimo’s 100 words for snow. 2/21 – An amazon/eBay selling/shipping/rating simulator. Essentially this is like an idle game, maybe? But it you basically start out with an apartment full of stuff, and can sell it on amazon or eBay. You can also buy stuff on Amazon or eBay or craigslist (where it will be the cheapest). As you progress farther into the game, you have opportunities to buy more expensive things and sell them for more profit until you are essentially a millionaire buying private jets on Craigslist and selling them on eBay. 2/22 – Tuesday this week I had a couple of entries, (and was oddly productive to boot, so I was on a roll, productivity-wise). One of them was a rant about elements of action puzzle games, and about how puzzle is the operative word. I ranted about the failure of some games in the genre to provide a decent puzzle, and the blurry line between action puzzle and straight-up action. Someday, maybe I’ll turn the rant into a full-blown blog post. The other entry was about a couple of random match-3 musings. Mechanics, I guess, but more re-framing the “board” of match-3 puzzles. This was specifically about “swapping” puzzles, like bejeweled, but the ideas could probably apply to any grid-based puzzle game. Essentially thinking about two different ways to make the game boards themselves infinite. (Ways I haven’t seen before.) One of them involves moving to 3D, the other is more about recursion. It’s worth noting that I spent pretty much all week working on the Unity prototype I mentioned last week. I’ve got a crashing bug that I need to track down, but otherwise the game is at a place where I’m super happy showing it off. (It doesn’t crash in the Unity IDE, just when I publish it to my iPhone.) Anyway, this idea, as well as the rest of the entries from this week reflect how “in the headspace” of puzzle games in VR I’ve been. I posted an informal poll on the MSP GameDev Slack, and the name that was the clear winner was “Puzzle Prison”. Also in the running were Drop Cage, and VR Drop. Another one that I’m not seriously considering is Collapse-in-a-box. 2/23 – This variant on Puzzle Prison was essentially to make each of the blocks two-sided. Tapping would rotate to the other color, and no longer break blocks, so a group would only disappear once you have three in a row, or something along those lines. 2/24 – A brainstorm around what a VR puzzle game in the vive would look like. (Where you can move around in the space.) I had a couple of different ideas, both of which involve dividing up the volume of space into cubes, and putting “guide lines” into the space. The first idea was to turn your hand into a hammer, and allow you to push around blocks in the space until you have a decent sized group, and then “break” them by hitting them swiftly with the hammer. The second idea was to fill the space up arm (controller) height by default, and then allow you to swap them, making matches of the same color to “dig down” into the cubes. Maybe you have to dig your way to the floor, or maybe the cubes keep rising, and if they get to head height you lose. In both ideas, an open question is whether you would be able to see through the cubes, or whether they would occlude the cubes behind them. 2/25 – Another brainstorm about Puzzle Prison, both about level progression, as well as three new possible cube types (not powerups, but new game types, like the entry from 1/23). The idea was that as you “beat” a level, you are introduced to additional cube types, and eventually you play them in the same game. I’m not sure if I will add this to the game, or if it even needs it. I’ve got to have it more playable and get some more feedback, first, I think. This week I have spent fairly productively prototyping a simple Action Puzzle game playable in VR with Google Cardboard. This idea actually came from my Idea A Day project entry on 1/20. Here is an early screenshot I posted in the MSP GameDev Slack. 2/11 – Deckbuilding meets autorunner. Essentially I was thinking more about the idea from 1/29 and also about generative dungeons and had the idea to combine them. So you would have a deck of dungeon crawling “areas”, and a character that does the crawling. The character would move forward one dungeon segment every turn, no matter what you play, so if there is an enemy there, but you haven’t played the right equipment for him, that might be the end of your run. 2/12 – Thinking about goals in puzzle games, came up with a Tetris variant where you have pre-filled spaces on the board and you have to surround them. In retrospect, this is kind of like a “garbage clear” mode, but where the goal is to surround all the garbage instead of clearing it. 2/13 – Another action puzzle game idea, this one like bubble bobble, but you can only shoot upward into one lane at a time. Either turn-based, where you shoot and move on to the next lane immediately, or on a timer, where you can shoot into one lane at a time, but move to the next lane after a set amount of time. 2/14 – I’ve found there are definitely days where I think of a phrase or a game title, and then that becomes the brainstorm. I start exploring what it would look like. Sometimes, it’s just dumb, like this day’s phrase: “Hungry, hungry tetrominos”. I sort of sketched out a bunch of mechanics. About the only interesting thing that came from it was the idea of doing a square grid puzzle game, but rotated 45 degrees. That has potential. 2/15 – Obviously a lot of my ideas come from mashing up existing games and mechanics. For 2/15, I basically just started by listing out match-3 mechanics, trying to find a combination that hadn’t been done in some way before. (That I know about.) I ended up with a (quite short) list of powerups in match-3 games, (so actually two lists now that I think about it, but one was in bullet points, the other in a rambling paragraph), but not really anything original or useful. 2/16 – I hesitate to link this here, since I may not keep this up forever, but here’s that prototype I mentioned in last week’s post, one I’m calling Line Combine. To play it, you basically just click the arrows and that shoots a line into the game board. It’s definitely too easy (and random), as I have played it to about 200 or so points, with no sign of needing to stop. I’ll probably update that link if I work on it again. One thing that would be fairly easy would be to introduce more colors at some point, which would of course make it harder. Anyway on 2/16 I had two entries: One was about ShipDeck mechanical changes needed to remove ammo and fuel cubes. (Don’t think I’ve mentioned ShipDeck on here before, but it’s a ship building deckbuilder that I’ve been working on for over two years now.) The second was how to use some of line combine’s mechanics in an isometric two-player platformer/battler game. 2/17 – A text adventure (with text parsing, like Zork) where you move around in (and explore) a world that is basically just colors and shapes. You have to figure out what’s going on (there is an abstract strategy game being played), then figure out what the rules of the game are (it shouldn’t be one that is already known), and then figure out how to play against an AI to “win” the game. 2/18 – I am so excited about this idea that I’m dying to begin prototyping. But I’m committing to getting the VR prototype playable before I start another one. Essentially, it’s an astronaut themed six degrees of freedom game, but played on a grid. So the grid spaces are subdivisions of a cube, and you can rotate the cube at any time to change the plane on which you are moving. I imagine the gameplay to be a mashup of Sokoban and Threes!, and I have quite a few specifics, but I think I want to keep them under wraps for now. 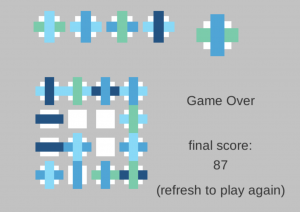 Interested, as I am, in the family tree of puzzle games, when I wrote up my post about deconstructing Tetris, (the one where I go a bit into the mechanics of 1010! and Hex FRVR) I’d completely forgotten about this simple little iOS puzzle game from way back in 2009. Predating my own ActionChess by about two weeks in the app store, I remember playing a ton of this simple little puzzle game called Blop when I first discovered it. The goals are slightly different from our line-making in Hex FRVR and 1010! ; this square-grid game is actually more of a match-3 than a Tetris variant. The block shapes that appear are either 4-color squares or an angle made of 3 squares. And where color doesn’t matter in 1010! or Hex FRVR, here, the color is what’s used to remove pieces from the board. The board itself is 10×10, and each level the goal for number of matching colors increases. The first level, as soon as you connect 3 of the same color, they are removed from the board. After you’ve removed a square from each grid space (there is a handy “show” button to show you where you haven’t yet removed one), then the level increases, as does the number of squares you need of the same color. The gameplay is at your own pace, and you do see a queue of the next few pieces, so you can plan ahead to maximize your strategic brain burning. When picking up the game again after all this time, I found it didn’t quite hold my attention the same way 1010! and Hex FRVR have for so many hours. I’m not honestly sure why that is the case. The complexity is about the same, maybe a tiny bit higher, due to the color matching rather than line-making, but I found myself playing the game a lot slower than I do those others. 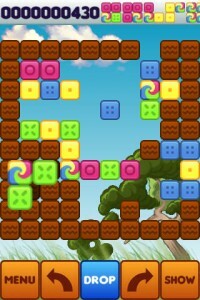 – The squares to be placed appear “hovering” on top of the gameboard. They can and do get in the way of any squares you have already placed underneath them. I will say, the game has held up remarkably well. It functions just fine after all these years. Notably, it did see an update last back in May of 2013 that added (among other things) multitasking from iOS 4. Much of this week I felt pretty uninspired, and most of my ideas felt bland and pretty lame while I was brainstorming. (I forced myself to push through, but that won’t stop me from being apologetic about it.) Anyway, on 2/7 I spent at least ten or twenty minutes thinking about games to enhance or encourage creativity before realizing I was basically just re-creating improv games. Talking about improv games is probably worth a whole post, and I’m sure resources exist that describe and catalog them in detail, but the ones I played — while participating in Comedy Sportz in high school — were all “designed” very specifically to teach/reward creativity. I definitely believe that creativity can be enhanced with practice, hence this project. 2/5 – At some point I bought a giant tub of 1,000 square 1mm cubes in 10 different colors. They are great for paper prototyping. I spent some time on 2/5 playing with the cubes with my 5-year old daughter (mostly counting them). After she lost interest, I sketched out a quick game where you draw a number of them from a bag and play them onto a gameboard. In retrospect, it occurs to me this idea has a lot in common with my Action Go as board game idea from 1/1 and 1/2, but without tetrominos, and adding a couple of interesting mechanics. I will have to do some thinking about these together with an eye toward possibly integrating those new mechanics with the original idea. 2/6 – I finally got my prototype of the game I started on 2/3 working. The project’s preliminary name is LineCombine. I was happy with how quickly this came together, but I’m still not as competent in Unity as I am in Xcode. You can see a screenshot of the game at this point. Anyway, as happy as I was to have it playable, I realized quickly that it was way too easy. And not really all that fun as a result. My brainstorm for the day was about ways to improve this. Now it’s the age-old question of how much more effort should I put into a prototype that is not yet(?) all that fun. 2/7 – An idea for a go variant played with only blocks of stone groups that already have two eyes. 2/8 – Card Battler game where each card is an upgradeable tank, and deploys to a battle zone each round. Also: A musical puzzle game where each whole note is a “class” of unit, and there is some kind of paper-rock-scissors thing happening, like how water beats fire, and earth beats water, etc, only all 7 notes on a circle defeat one another, the next higher note defeating the one below it (so a C beats a B, etc.). Maybe this basically just turns into a musical identification game. 2/9 – A physical board game idea with big chunky components that need to be placed on pegs. You take turns placing pegs or game pieces. Many of the pieces need two pegs (in various different positions relative to one another), and I guess the big twist is that the board consists of a right angle, so pegs can be placed horizontally or vertically. This one will probably be hard to balance/tune without a physical prototype. Second idea on the 9th was a platforming game where you play as the spikes. Maybe the player jumps automagically, and you have to move to catch him/it on its way down, or maybe you are a jumping spike, trying to impale moving people running out of your way. 2/10 – Spent some time thinking about a board game recommendation engine, specifically implemented in VR. I also came up with some ideas for 3D visualizations in VR. Not really games, any of them. 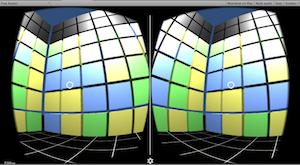 I’m hoping the upcoming VR revolution will include a “demoscene“. I think we saw some of that when the DK1 first came out, but I didn’t have one at that time, (yes, I’m kicking myself for not backing the kickstarter), so I was only aware of it peripherally. Once the hardware is commercially available, I’m hoping that kind of thing is available for download. Hard to believe we’re already 5 weeks into the year. For ease of finding these later, I added a category called Every Day to the blog and went back and re-categorized the old posts, so you can find them all in one place. Last weekend was the Global Game Jam, and I’m surprised I haven’t written about the experience yet, but here’s the game I made with some friends over the weekend: Life is Hard. The second entry on 1/29 was while I was writing up the previous week’s entries, and specifically the entry from 1/22. I did some more thinking about the opposite of Carcassonne, and how it could work to have tiles with goals or objectives on them (maybe in player colors), and also little wooden “walls” that you then place on the tile you play. 1/30 – Didn’t spend much time on this (since I was busy jamming), but I wrote up the only real idea I’d had for the GGJ theme of “Ritual”. Basically a game about the ritual of drug use, possibly a treatise on addiction. 1/31 – A combination of match-3 and “programming game” genres. Essentially you have a grid of gems (or whatever), and “program” some movement, then choose which tiles will make that movement. The more matches (sets of 3 or more) you can make with the same program, the higher your score for those matches. 2/1 – Another day with two entries this week, but both were pretty minimal entries (and likely influenced by my playing Realm Grinder in the background while I was working). Both also ended in “etc…”. First was A collapse! variant with idle elements. Essentially you can upgrade the grid to make it grow, upgrade the number of colors, etc..
Second was another idle game idea where you start off as a barista just selling coffee, and end up owning everything on the planet earth, launching into space, populating other planets in the solar system, fighting intergalactic space aliens, etc..
2/2 – I had the idea to make a board game played on a computer keyboard. The game I ended up flushing out a bit was an abstract strategy game. 2/3 – Sometime last week I spent about an hour playing the new iOS game Open Bar!, which I would highly recommend. This Wednesday brainstorm I was thinking about its similarities (and differences) to Strata, a game made by my friends over at Graveck. Then I came up with my own game idea that uses some similar mechanics. I then spent the rest of the day (and yesterday) prototyping it. I’ll post more about it if/when it gets farther along. 2/4 – I woke up from a dream where giant dice were chasing me. It was clear they were rolling, and when they touched me, the number facing me was how much damage I was taking. First dream that I can recall where I was actually inside a video game. The aesthetic was pretty similar to the cover of the Escape board game.